As much fun as those zany zoo animals are in the Madagascar franchise, I must admit-- despite being one of the only people on the planet who was absolutely positively bored to death by the Oscar winning film March of the Penguins -- that my absolute favorite aspect of DreamWorks Animation Studio's great series are those military penguins who starred in that amazing animated short on the original film's DVD and Blu-ray. Much like the little army green toy soldiers used in Toy Story to begin covert activities by spying on the child's birthday party to see which new characters would be moving on into "Andy's Room," these no-nonsense military penguins are essentially the Full Metal Jacket meets Platoon type kids characters-- always scheming yet working as a single unit (they are after all an indistinguishable army of one... due to their adorable "tuxedo" look) and they're such great characters that they're worthy of their own spin-off. 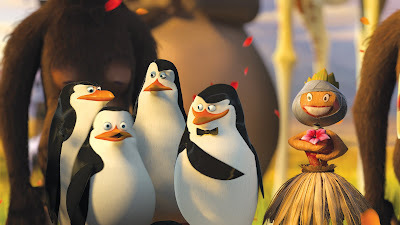 With this in mind it comes to both no surprise and positive joy that I recently learned those commanding waddling soldiers are starring in their very own Nickelodeon series, The Penguins of Madagascar. 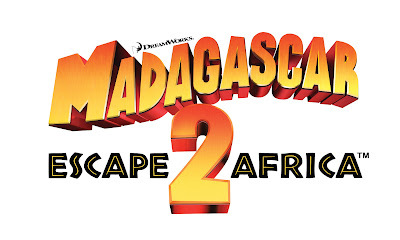 Including two of the show's episodes on this remarkable Blu-ray-- Madagascar: Escape 2 Africa is a penguin fan's dream (as they also show up in numerous featuettes, Easter eggs, etc.) but before I explore the contents of the Blu-ray, here's a second look at the original theatrical review of the film. 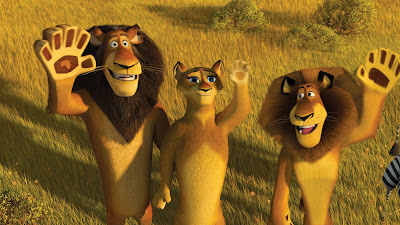 In 2005, DreamWorks introduced us to a memorable quartet of feisty New York zoo animals comprised of Ben Stiller's beloved, fame hungry Alex the lion who never met a visitor he couldn't charm with his photogenic charisma, David Schwimmer's hypochondrical neurotic giraffe Melman whose greatest fear is being relegated to an HMO, Jada Pinkett Smith's maternal hippo Gloria, and Chris Rock's zebra Marty. And in the first film, Marty's identity crisis of not knowing whether or not he was black with white stripes or white with black stripes found him longing to seek greener pastures outside the zoo which led to a hilariously chaotic chain of events which found the foursome in Madagascar. The sequel picks up where we left our characters, still stuck in a strange land but when the conspiratorial and ambitiously militaristic penguins repair an old crashed war plane, the group decides to slingshot their way into the sky and make it back to the NYC Zoo. Unfortunately, while first class section of Air Penguin still consists of Vivaldi and better entertainment than the cargo like coach section, their safety track record is less than stellar. And in a scene right out of Almost Famous as they plummet towards a crash landing, the group all confesses something to one another, culminating in an uncharacteristically brave move by Melman who pledges his love for Gloria. However, par for the course of the unlucky Melman, we quickly realize that Gloria has fallen into a deep sleep. 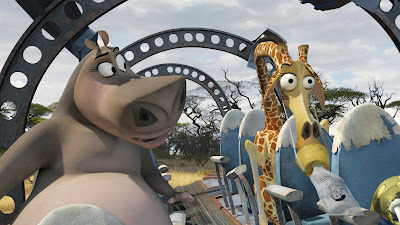 Needless to say when they land in the beautiful yet wild terrain of Africa, he clams up once again as-- much to his horror-- Gloria finds herself being wooed by a Barry White styled hippo, named Moto Moto (Swahili for "hot hot" according to the press notes) who has a thing for "big" and "chunky" women. While the penguins pledge they will repair the plane in an estimable six to nine months with "grit, spit, and a whole lot of duct tape"-- not to mention an alliance with the "higher mammals" a.k.a. monkeys whom they intend to exploit for their brain power and opposable thumbs-- the rest of the group begins to venture out into the unknown. Following a terrifically exciting and touching opening that introduces us to the origins of Alex the lion who was abducted when he was a cub by profit seeking hunters, Alex is startled to reunite with his birth parents, including his father (voiced by the late Bernie Mac). While Alex lives to "move it, move it," dancing with gusto to the cheering crowds of Manhattan and posing like Ben Stiller's alter-ego Derek Zoolander (from his model comedy Zoolander), he finds that there's not a lot of call for "razzle dazzle" in Africa where his father, the alpha-lion is trying to be overthrown by his arch-nemesis (30 Rock's Alec Baldwin). Since the arc of the Madagascar 2 mostly surrounds Alex, the film which juggles the plot-lines of more than a dozen returning and new characters does get a little crowded. Specifically Chris Rock is shortchanged with his subplot focused on dealing with the idea that he may not be "one in a million" when he meets an entire herd of zebras identical to himself, but the rest of Madagascar 2 is fast-paced, funny and as creatively inspired as the first film. Due to the success of the penguins from not just the first movie but also the wonderful Christmas short film available on the Madagascar DVD, they're given a lot of excellent material in the follow-up as they embark on "Operation Tourist Trap," where one penguin takes one for the team, getting hit by a jeep so they can carjack a group of tourists and hot-wire the vehicle to use for spare parts. Additionally, I was thrilled to learn in the production notes that the penguins will soon be getting their own animated series. Cleverly providing a few extra challenges for the characters as they must deal with the topical environmental issue of lack of water as well as the problems of "group think" and peer pressure, there's also a wonderful subplot surrounding human characters headed up by the vicious elderly woman from the first film who is unafraid of using her handbag as a weapon. The addition of humans adds some unpredictable action and surprising laughs to reinvigorate the film when it threatens to move into overly sentimental territory. Still culling witty, intelligent humor from pop culture, much like the first film, Madagascar 2 is filled with jokes sure to play even better to adults than children as Alex describes himself as a Fosse protege, pays homage to West Side Story, and the penguins must endure union talks and the possibility of a labor strike when the Darwinian benefited monkeys realize they've been manipulated, along with Gloria lamenting about New York's shortage of men and parking spaces. Thankfully, a family movie that-- similar to Pixar's brilliant Toy Story films-- adults will be all too eager to take their children to see, Madagascar 2 is further proof of the high quality animated fare being served up by the studio that gave us Over the Hedge, Kung Fu Panda, and Shrek, and one where the passion for the project shines through by the studio right from its tongue-in-cheek opener as the penguins knock out the familiar Huckleberry Finn character fishing on the DreamWorks moon. And while it's safe to say that the kids will want to "move it, move it," you'll be wishing you had a remote control to back up a line here or there to keep up with the joke-a-minute-pace. After only a few moments of playing the Magascar: Escape 2 Africa Blu-ray, I realized I never wanted to watch another animated film-- especially a CGI based one-- on DVD again. With all of DreamWorks Animation SKG's "feature films...now being produced in stereoscopic 3D technology," the company which has upon this article "released a total of seventeen animated films" has managed to surpass Pixar with an extraordinary transfer that simply astounds. Due to its original source material and digital background, it's the ideal move to Blu-ray as film is truly 3-D quality, adding incredible depth, a sharper view of all the little details and in-jokes the animators purposely threw in. 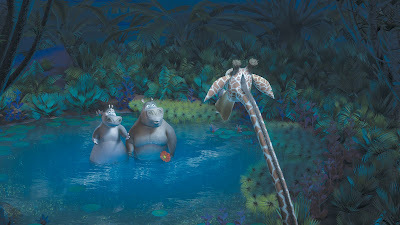 It's these details and more we discover on the disc's innovative Animator's Corner feature which allows you to watch the film with a visual commentary track showing you everything from scouting out African locations to studio reads by the actors, animators acting out the movements and trying to make the animals more life like, cast interviews, and the impressively audacious journey the process takes from pencil sketches to computer animation to our family rooms. Additionally, it boasts a trivia track with facts about both the setting and animals of what we're watching but also about the production itself (such as one item that explains that actor Chris Rock provided the voice for every single zebra and his alter eg0 Marty's famous expression "crackalackin'" was his own creation). While the picture is mesmerizing, the sound is also incredible, even for folks who-- despite the recent upgrade to Blu-ray (as players have been flying off shelves) have yet to purchase the expensive multiple speaker surround sound sets for their screening room as you can hear every single audio detail in the crash from Air Penguin or as the characters run throughout Africa. With an emphasis on creativity and improvisation, there's a number of behind-the-scenes featurettes including the "It's a Family Affair" look at the cast which shows Jada Pinkett Smith and her daughter side by side in the studio discussing their take on the same character as well as the David Schwimmer's analysis that half of the material in the film comes simply from "riffing" in the studio. And while of course, the filmmakers state that there is a script, when talents like Ben Stiller and Sacha Baron Cohen are in the studio, sometimes they'll just run off on tangents and new ideas are developed. Amusing anecdotes abound as co-director Tom McGrath discusses playing a Penguin and Alec Baldwin jokes that his character has seen better days but at least he still has his hair-- ultimately as Chris Rock sums it up, when it comes to animated movies "you can really do bad[ly] with talkin' animals," and there's sure to be more to come for this franchise in particular. Although thankfully this time around as the filmmakers acknowledge the penguins get double the screen time and be sure that-- despite feeling nearly overwhelmed by the amount of bonus material included-- you seek out the bonus Nickelodeon shorts including the great "Popcorn Panic" and "Gone in a Flash." A film that truly needs the Blu-ray format to appreciate its glory in a visual and audio achievement that far surpasses its theatrical release, DreamWorks' Madagascar: Escape 2 Africa is not only better than the first film, but it's the best animated work that I've seen so far on Blu-ray and now that I've been spoiled, it'll be hard to check 'em out in DVD. 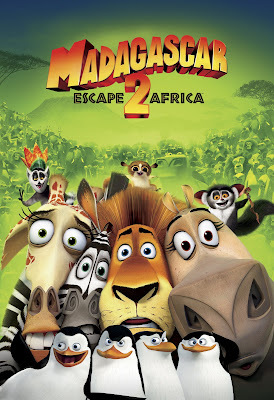 The Madagascar: Escape 2 Africa Blu-ray will be presented in 1080p High Definition with English 5.1 Dolby True HD, French 5.1 Dolby Digital and Spanish 5.1 Dolby Digital with English, English SDH+, French and Spanish subtitles.